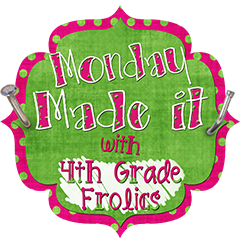 I've always wanted to link up with "Monday Made It," but that always required me to actually make something. Don't get me wrong, I love a good project, but I have just found myself too tired to do much of anything lately! I spent most of the morning in my room rearranging desks and putting things back where they belong, so I was worried I wouldn't have the time to make something today. But alas-I actually did! Yay me! I got the idea of different erasers for my whiteboards off of Pinterest a while back and I really wanted to give it a try. My kids always seemed to lose erasers or accuse someone of taking theirs, and I was really looking for a way to eliminate all of that. Enter the pom-pom eraser! I bought a package of 80 colored pom-poms at the Dollar Tree today. They were a variety of colors, so I plan on color-coordinating each pod to keep markers where they belong. The idea is to hot-glue the pom-pom to the cap of the marker so that when the kids put the lid at the top of the marker they will have a built-in eraser. Genius, right? All I had to try it on at home was my own boys' dry erase markers in their homework bucket and my husband's super glue. For whatever reason (maybe the fact that I was cooking dinner, watching The Young and the Restless, filling out a info form for my son's teacher and dealing with the dog), I glued the pom-poms to the wrong end of the marker. Nonetheless, it still worked. My boys won't be putting the cap on the top of the marker anytime soon, but they do have a fabulous eraser and will quit wasting my napkins. What I noticed: If you use big Expos, you probably shouldn't glue the pom to the lid because the kids won't be able to attach it to the top of their marker. In that case, I guess gluing them to the bottom makes sense, but you need to make sure lids don't get lost in the shuffle. The other skinny dry erase markers I had could have the poms glued on the lid with no problem. I plan on doing my classroom set tomorrow when I'm not so distracted. But-I did it! I actually made something on Monday! Hi! Just found your blog! 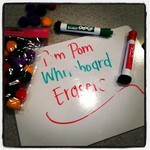 Love the dry erase pom-pom erasers! I am now a follower and hope you will check out my blog.